Extremely durable, this 35cc Catheter Tip Syringe can be used over and over. The silicone plunger operates very smoothly and easily. Primarily used when alginate or stone needs to be "squirted" into a small space, like into the interior folds of the ear. 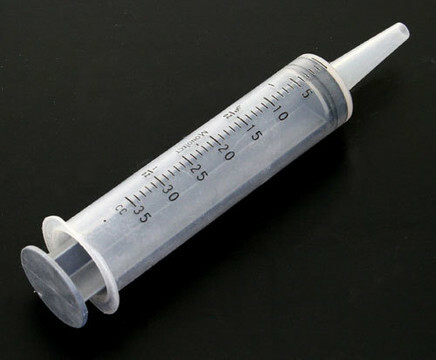 The syringe should be part of every lifecaster's armamentarium. After 20-30 uses and cleanings, the black silicone plunger will get a little dry and the action will get stiff. Just use a little Armor All or other silicone spray on it and it will work like new.